The Sentinel-3 mission has been designed to operate in an orbit that enables the satellite constellation to collect data products required for services provided by the GMES (Copernicus) program. The operational character of the Sentinel-3 mission calls for fast data delivery and a high revisit time with global coverage, important requirements that have to be considered when designing the constellation orbits. 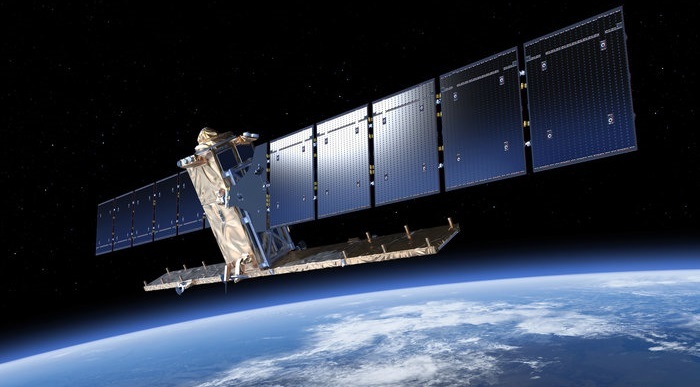 Sentinel-3 satellites operate from a high-inclination, Low Earth Orbit. 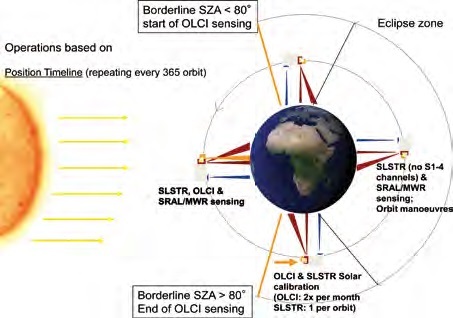 The orbit selected for Sentinel-3 is the result of a trade off between the constraints imposed by the four instruments as well as operational constraints such as revisit time and communication requirements. For Sentinel-3, an orbit was chosen that provides a short revisit time for the optical instruments, a short spacing between ground tracks for mesoscale ocean topography observations, and a similar orbital geometry to the Envisat mission to ensure similar solar illumination of the ground for data continuity. For the Ocean Color Mission carried out by Sentinel-3’s OLCI instrument, the satellite needs to be placed in a Sun-Synchronous Orbit with a Local Time of Descending Node after 10 a.m. in order to maximize the solar elevation angle and to avoid morning haze and clouds. For the Sea Surface Temperature measurement, requirements call for a Local Time of Descending Node earlier than 11 a.m. to minimize the impact of sun-glint on the ocean surface, and to avoid afternoon clouds. Considering all constraints, the selected Sentinel-3 orbit is polar, sun-synchronous with an inclination of 98.6° and a mean altitude of 814.5 Kilometers. The Local Time of Descending Node is 10:00 a.m. This creates a repeat cycle of 27 days. With only one satellite, the full Sentinel-3 mission performance can not be achieved given the requirements for ocean and land coverage. With a single satellite, the ground track spacing at the equator would be 2,810 Kilometers after one day, 750km after a four-day subcycle and 104km after 27 days. These orbital spacings would correspond to revisit times of 3.8 days for ocean color, 2.2 days for land color and 1.8 days for surface temperature measurements by SLSTR in dual view mode. The second Sentinel-3 satellite will be placed in an orbit identical to that of the first satellite, but with an offset of 140° so that its ground track falls near the middle of the ground tracks of the Sentinel-3A satellite. In a two satellite constellation, the inter-track separation after a 27-day cycle is reduced to 52 Kilometers. With two satellites in operation, ocean color revisit time is cut to under two days, land color revisit time is 1.1 day and the SLSTR surface temperature revisit period is less than one day. Coverage improves with increasing latitude. The Sentinel-3 satellites are designed to have sufficient onboard resources to support the complete instrument schedule, covering the full duration of a mission cycle of 27 days. The satellites employ autonomous Fault Detection and Recovery Systems and can operate nominally for 72 hours without any ground intervention, even in case of a single onboard failure. Nominal mission operations call for two S-Band comm passes over the Kiruna tracking station per day for command and instrument schedule uplink and housekeeping data downlink. However, the satellite will be visible from Kiruna for an average period of ten minutes during each revolution with the exception of four blind passes per day when the satellite will not pass over Kiruna. Science and service requirements call for data products to be available in near-real time and therefore a high degree of automation is part of the data reception, processing and distribution architecture on the ground. Autonomy is also part of the space segment as the satellite will, in routine operations phases, carry out instrument commanding on its own based on geographical position to select the data delivered by the instruments based on terrain. 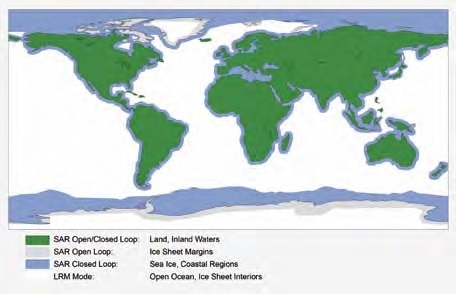 Changing geographical boundaries such as ice coverage will be updated periodically to enable the satellite to command the instruments accordingly. 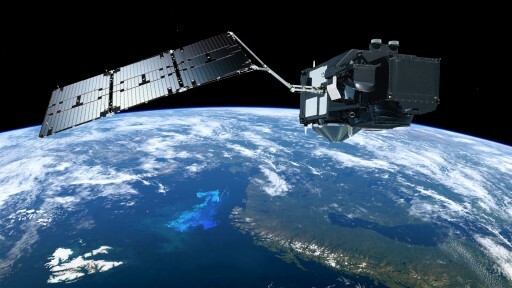 The commanding of the Sentinel-3 instruments is repetitive in nature based on satellite position, either in its orbit with respect to solar geometry, or relative to the ground area being overflown. In routine operations, the OLCI instrument will be only active when the Solar Zenith Angle is under 80° and so will the visible channels of the SLSTR instrument. The infrared channels of SLSTR will be active continuously as will be the GPS receiver and DORIS orbit determination systems. 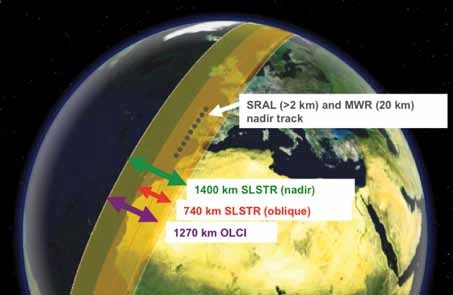 SRAL operates up to 75% of each orbit, selecting from its different observation modes based on specific geological characteristics. With its X-Band comm terminal, Sentinel-3 can achieve data rates of up to 520 Mbit/s which is sufficient for delivering one orbit worth of data in a single ground station pass. Given the desire to release data in Near-Real Time under three hours after acquisition, one data dump per orbit will be needed.